The tutorials and pictures are very clear. This is one of my favourites. I know very plain, but it's such a pretty natural look. The items used were from Beauty Maker, which I couldn't find in Hong Kong. In this tutorial, I believe you use a brown gel liner and then smudge it onto your upper lashline and finish off with black liner on the upper lashline. For the cheeks, contour and add highlight under your eyes. It doesn't say what color blush, but it looks pink. The contouring shade in the middle is similar to the ones by Benefit. 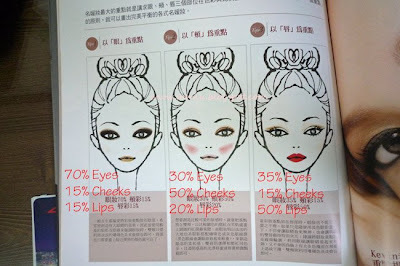 A very useful guide to where apply makeup depending on what you want to be the main focus on your face. I would usually go for the one in the middle. I did an entry for Chyix2's spring contest. I don't like taking self portraits...it takes me forever to get a picture that I think is decent. Anyway, the look for spring is a mix of green and pink. I love pink shadows and I thought green would be a nice touch. Kinda reminds me of Easter eggs. I forgot to take a picture of the MM Neo Automatic Liner BK911. 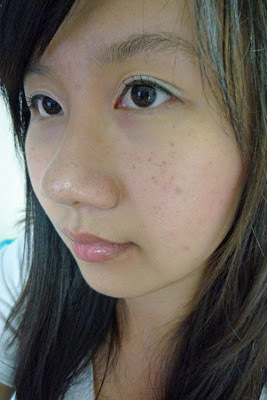 The base makeup I used is on the side of my blog. I used the mint green shade from the Maquillage palette on the outer and mixed both of the pink shades for the inner (from the Coffret D'or palette). 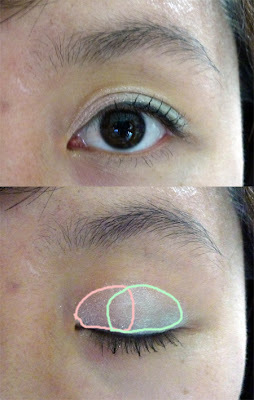 Since it was for spring, I lined my eyes very lightly to keep the look fresh and natural. I used the MM Lash Expander Frame Plus. The mascara melted a little bit when I used the heated lash curler >_< The pink gloss is Stila Gumdrop. I think it's so nice, but my pigmented lips make it look like I didn't even put on pink gloss! Finish off with the Coffret D'or blush (all 3 color stripes) just under the apples of my cheeks up towards the hairline and highlighted the areas under my eyes. Did you notice anything? My eyebrows are growing out very nicely!!!! I think it's getting more fuller and they're getting fuller in the areas between both brows...the brow there was really sparse. It's not turning into a unibrow..haha that's not what I meant. I've plucked the strays inbetween my eyes and brows, but I'm still not too sure how to shape them properly without making mistakes. lol, I love u miumiu. It's good stuff! Cute look! btw i love ur eye makeup! so fresh looking haha! I like your look! very spring - ish :) Very fresh ! and oooh i want those books! yes, my feet hurt all the time ... :( even with flats. so it is a special shoe when it is able to make my feet happy. I love the pink and green, soo fresh and cute, straight outta a Japanese beauty mag, hehehe. I think I have that Stila gloss too! Your sping look is very natural and cute. haha..I've never entered those contests before, think it's very hard to do the makeup and then take a good photo. 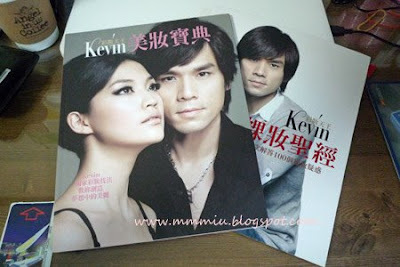 The Kevin's beauty books are interesting, maybe I'll get them when I got back to taiwan. nice, clean, and fresh look! aww I've beenlooking for good make up book but I will never be able to understand that!! BOO!!! and i love my kevin bible, the main one is nice, the secondary I could do without -- and as for translation, thank goodness for PICTURES! ooo pretty look! good luck with the contest! :p i saw the prices.. they are very tempting! You and your drinks, hehe you remind me of me! I usually always have coffee around hehe. I actually really love fresh looks like that one! Hmmm I don't think I've really done smudged out looks lately! Good idea hehe. I'm trying to get my brows to be fuller too! Love the look! I like the different colors. I can tell you have pink gloss on! Looking good! I really like your eyemakeup. YOu look very pretty in your look! Is it me or is Stila lipglosses tend to run too sheer?